A Personal Dining Etiquette Consultation provides private training tailored to the needs of an individual or small group. Many clients prefer discretion when receiving such instruction, choosing to enhance their potential for career success and/or social advancement inconspicuously. If you are such an individual, a Personal Dining Etiquette Consultation is perfect for you. During your Personal Dining Etiquette Consultation Robert A. Shutt will dine with you (or an individual you designate) and up to three guests. He will lead you through the guidelines, origins, and nuances of either Business Dining Etiquette or Social Dining Etiquette in an informative and entertaining manner. 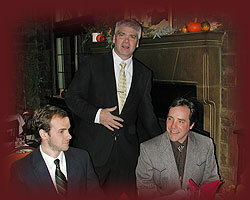 While dining, Robert A. Shutt will answer your specific questions and address your unique concerns. After the meal, you will receive a written report summarizing his observations and recommendations. You can also schedule an optional second meal, allowing you to practice what you have learned in a friendly, supportive environment. A Personal Dining Etiquette Consultation gives you the confidence needed to Shine While You Dine in any business or social environment. Contact Robert A. Shutt now to find out more.